Our Tallahassee Realtors can find you the best deal on Tallahassee Homes for Sale. 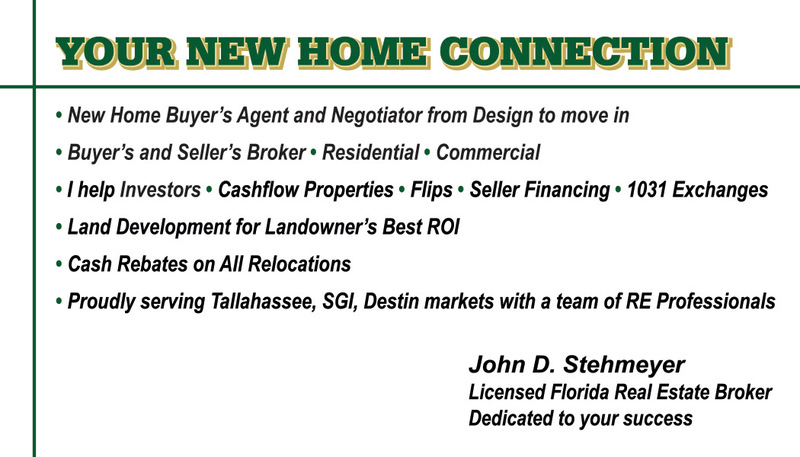 We also specialize in selling Tallahassee luxury homes ($250,000+). 271935 $559,900 2957 4 3 10601 Centerville Rd. 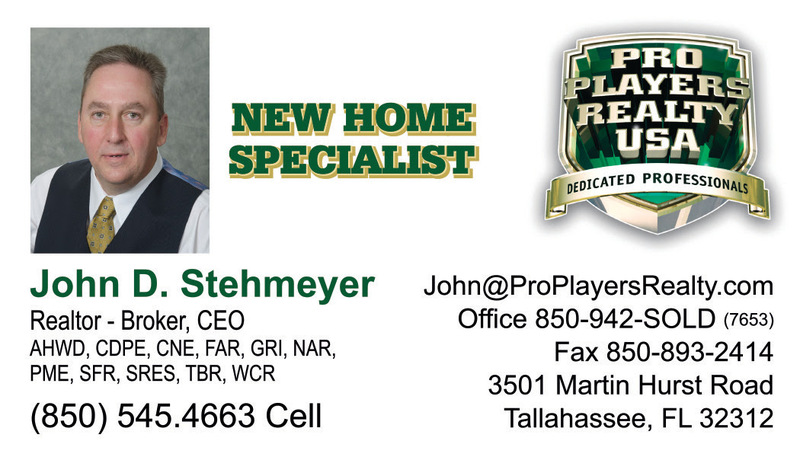 Please Call John for a new home in any price point and area. 850.545.4663 That’s 545-HOME. I will carefully analyze your budget, future resale value, cost of ownership, and advise you as we select your homesite. My personal approach removes all the stress of the home building and buying process. I have a special listing program to help you sell your trade in home. I can help you with pre-owned homes too. Click here to search for pre-owned homes. 1,000	to 5,712	Sq. Ft. Pending new home sale. Lot size approximate. Photos of previous Elaina model. A highly desirable area for private medical practices, physician groups and other healthcare providers looking to have a presence in one of the most well-known and established medical areas in the Southeast. This .54 Acre is located on the corners of Physician and Surgeons Drive, property is located within site of Tallahassee Memorial Hospital, Southern Medical Group and 5 minutes from Capital Regional Medical Hospital. Zoned CM - Commercial Medical which allows a multitude of uses. This is a preliminary subdivision of 18 lots with most of permitting already in place. Develop Residential Land inside Capital Circle NE across from Briar Chase Subdivision and near Publix Shopping Center, Hospitals and Public Facilities Inside Capital Circle N.E.. Land zoned R-3. Property located on corner Alexis Ln & Alexis Court. Make your Highest and Best Offer. Come home to this charming, updated home in the heart of the city. There are beautiful wood floors throughout the house, and the kitchen is updated with Stainless Steel appliances, gas stove, granite countertops, an island with a sink and wine fridge, and a very large pantry. A huge master bathroom with heated floors, walk-in shower, jetted tub, and walk-in closet is rare in this area. Open the sliding glass door to a great multi-level deck that is perfect for indoor/outdoor entertaining and a large fenced yard perfect for kids and pets. Other bonuses include a tankless gas water heater, and workshop attached to the house for extra storage space. The garage and circular driveway provide plenty of space for parking. This wonderful home is located on a very quiet street minutes away from the hospital, midtown, and downtown. Pending new home sale. Lot size approximate. Photos of previous Cypress model. Great 3 bed/2 bath home in the highly desired Eastgate neighborhood! Home is very well maintained, and in great condition. Living area includes a family and living room, large kitchen and dining area. Spacious master bedroom, with bathroom. Good size back yard, with privacy. Home also has a back deck that is spacious for entertaining and grilling. Don't miss out on this home in a great proximity to restaurants and shops. This house is what Old Town/Mid Town are all about! Lots of charm and unique elements combined with updates and upgrades make this home one that will go fast. 3 bedrooms and 2 baths with over 1700 square feet nestled just down the street from downtown and the Mid Town shopping/dining that has made the area SO popular. Original hardwood floors, spacious living and dining rooms, very cool screened porch, and a detached one car garage. All brick home with new appliances, crown molding and some glimpses of classic early mid century craftsmanship. This charming home is a must see! Great lot inside Capital Circle off of Mahan Drive. Super convenient and quiet cul-de-sac that backs up to Evening Rose. The shape allows for about an acre of usable space. 784	to 6,133	Sq. Ft. Wooded 6 Acres off Miccosukee Road, High and Dry. Adjoining 7 Acres With Creek is also available. Property is a portion of the existing Calvary Chapel campus. Offered for sale is the 8.09 acre parcel that includes a 2444 SF home that is currently used as church offices, a detached garage currently used as office and storage space, and a barn currently used for equipment storage. Property also includes a brick courtyard in the back, cleared acreage at a high elevation and a gravel drive and parking area. Would be an excellent redevelopment candidate in the booming Mahan corridor. Zoning is Urban Fringe and it is outside of the Urban Services Area. Property to be subdivided from main parcel upon sale. Lot is irregular - measurements are shown in graphic provided in photos. Pheasant Ridge off Centerville Road! This one owner home is all brick on a corner lot with a circle driveway. Beautiful hardwood floors, Gas Fireplace with custom builtins, open plan with split bedrooms. Huge Master suite with large walkin shower and separate tub. Office with custom cabinets in next to Mater suite. Family room off kitchen and rear sunroom. Fenced backyard with large deck. This is a large 2861 square foot home in excellent condition for a great price! Amazing Home, with excellent bones. Brick 3 sides / 1 side hardy. Overlooking Shakey Pond. Home boast original Harwood floors, spiral staircase soaring ceilings plus much more. This 4bed 4bath has awesome potential. The roof was replaced in 2015. Priced below appraised value. 17.5 acres in NE out Centerville Road. Lush, high, dry land with large live oaks, scattered pines and nice brick 2BR/2.5BA cabin style house. Pasture for horses and chicken coop. Live in the cabin while you build your Dream Home! Cabin features large screened front porch, open floor plan living area with tile floors and wood burning fireplace. Huge master bedroom suite downstairs with French doors to nice deck. Master bath features garden tub and 2 headed step in shower. Upstairs is guest suite with full bath. Beautiful views of the land from every room. Country living at its best! Beautiful Kinsail in Villages of Killearn home priced to sell quick. Located in private cul da sac lot with large backyard. Open floorplan featuring huge family room with vaulted ceilings. Large master bedroom with walk in closet is a must see.... Don't wait on this fantastic property. Beautiful, high and dry property on popular and desirable NE side of Tallahassee. This 1.5 acre piece of property is a perfect spot for a dream home! Just minutes from popular stores and restaurants. Beautiful one story home with Open Floor Plan. All Hardwood Floors in living area and bedrooms, Ceramic tile bathrooms, Large Walk in Shower. Large brick gas fireplace, heats entire house. Beautiful Kitchen with upgrades, separate dining room, 10 foot and 12 foot ceilings. Local school bus service for Moore Elementary, Montford Middle School and Lincoln High School. Less than 10 minutes to Tallahassee Memorial, Capital Regional Hospitals, Publix Grocery Store and Banks. High and Dry 2.5 acre buildable lot in great school zone. Only 11 homes on the street. Walk to Bradley's Country Store and enjoy the serenity of being out in the country but still in the NE quadrant of Tallahassee. Publix, Target and Bannerman Crossing only 8 miles away. If building a quiet little retreat without being too remote from the rest of the world is what you are searching for, this just may be the lot for you. Current owner has not checked for existing well or septic. Buyer to inspect and use their own due diligence period to determine building site and amenities. Gorgeous must see home located in Northeast Tallahassee. Just minutes away from grocery stores, Costco, and Miccosukee Greenway. Up-dated gourmet kitchen with high end appliances. Hardwood flooring and ceramic tile throughout, newer HVAC and too many other extras to list. This 4 bedroom, 2 1/2 bath brick home is located on over 1.2 acre beautifully landscaped lot with private drive. Lower bedroom (room for closet) with 1/2 bath and outside entrance perfect for office, playroom, hobby room or Mancave! Move-in-ready distinctive pool home with a spectacular fourth fairway golf course view in established Killearn Estates. The kitchen would win the heart of the most discerning chef. And you can enjoy wonderful holiday meals in your formal dining room or your 320SF sunroom with its amazing wooden beamed ceiling and bar for a view across the pool and golf course. The upstairs master bedroom has its own separate porch with a lofty pool/golf course view and an updated bath with a generous tub and separate shower. Tasteful updates have been consistently completed throughout this awesome, well maintained property. Welcome to the Miccosukee Land Co-op. Check out this custom built Contemporary home on almost 5 acres offering majestic live oaks & just under 2600 SF of living area. Horses welcome. Home features a split bedroom floor plan with 3 bedrooms and 3 full baths. Loft area could be 4th bedroom. Vaulted ceilings and wood burning fireplace in living area, separate dining, large eat in kitchen and inside utility area. The master retreat includes a study with built in book cases, lots of closet space, and jacuzzi tub in master bath. Kitchen has been updated with custom cherry cabinets, granite countertops, gas stove top, wall oven, microwave and refrigerator too. There is an enclosed room on the back of the home that would be great for hobbies or children's playroom and separate office. Approximately 3 acres has been fenced & cross fenced with 3 stalls and a chicken coop too. There is a lot of potential with this home, a must see at this price. Call for an appointment today. Fabulous NE Royal Oaks Waterfront on Huge Lot! Enjoy Cookouts and relaxing on the deck overlooking the large backyard! Wonderful Family Home and Top NE Schools! All NEW Carpet in living, dining and bedrooms! Rich Ceramic Tile in Eat in Kitchen and Huge Family Room with Beautiful Brick Fireplace and Builtin Shelves and Bookcases! 2 Pantries, Island and Tons of Kitchen Cabinets! Lots of Light and Vaulted Ceilings give this home a relaxing, happy welcome for family and friends! Huge Master Suite with 2 large closets, Large separate Shower and Spa Bathtub! 2 separate vanity sinks - his and hers! Huge Garage with extra storage closet! A Family home to Enjoy and Love forever, Will sell fast at this great price!